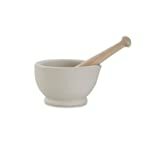 Unlike many others, this high-quality pestle & mortar is made from fully vitrified, no smell, no stain porcelain. Use for crushing chillies, then wash and use for pounding vanilla pods – the smell will not be transferred, and there will be no staining left in the bowl. Made in Stoke by 150-year-old company Milton Brook. Size 2. Capacity: 284ml (half pint). 14cm diameter, 8cm high.